OK, I know that some people see the face of their religious icons in random things. I’ve written about this a zillion times. And I know that sometimes it’s just pareidolia, our tendency to see faces in random objects. And I know that people will think it’s a miracle, when really it’s the end-product of thousands of generations of the evolution of our pattern-seeking abilities. 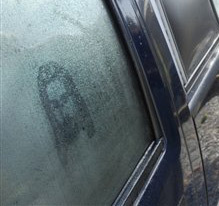 But then there’s stuff like this: a guy is “clueless” about how the face of Jesus appeared on his truck window, and why it persists day after day. Oh, I have a clue. It’s clearly not random, which means it’s either a) divine, or 2) drawn on by someone. My conclusion that it’s (2) comes from having a daughter who would take her finger and draw her name in the misty back window of my car when she was younger. And also doing it myself when I was a kid. And seeing eighty bazillion examples of this as a human living in America. So I think someone drew it on the window. The oil from their finger doesn’t wash off with water, so every morning the picture reappears with the advent (advent! Haha! A little funny for the upcoming season) on the morning dew. But, of course, that’s just me. When I hear hoofbeats I think horses, not zebras. And since I don’t live near a zoo or in the African plains, I’m guessing what we have here is a horse-drawn carriage. Um. Well. You know what I mean.